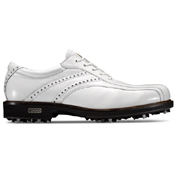 A classic shoe with a luxurious leather upper offering a sporty look and elegant feel. Soft and breathable lining feels like a second skin while supporting every move and swing. Traction is increased with high performance stability, allowing the body to move naturally.